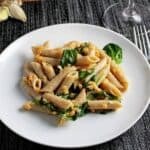 This Penne with Red Lentils and Ginger recipe is one of our most frequently made weeknight supper meals. This vegetarian pasta dish is fast, tasty and healthy, with lots of nice garlic flavor. Click here to jump down to the recipe. Fast, inexpensive and tasty: all that you want in a #WeekdaySupper! No wonder why we make this Penne with Red Lentils and Ginger so often. I tend to have most of these ingredients on hand, making it easy to whip up. A great follow-up to the theme of the recent Budget Friendly #SundaySupper. This dish is based on a recipe from the Vegetarian Planet , one of my favorite cookbooks (Amazon affiliate link provided). I’ve lightened it up with less butter then the original recipe, offset by an increase in garlic. So it’s got healthy going for it too. We enjoy this year-round, but there’s something about sage that says fall to me, making this particularly well-suited to fall. Give it a try next time you are looking for something fast and tasty! We’ve got the instructions for you in the text below and in the EasyRecipe card that follows. *Substitute dairy free spread or olive oil for the butter to make this dish vegetarian. Begin boiling water for pasta. Melt butter in a medium pan, let it start to brown slightly, then sauté garlic and ginger for a couple minutes over medium low heat. Add the lentils, sage, a bit of salt, cup of water, and a tablespoon of olive oil. Bring to a boil, then reduce heat to medium low, cover pan. Check and stir the lentil mixture every few minutes. If the lentil cooking liquid begins to evaporate, add another quarter cup or so of water. The lentils take about 15 minutes to soften…they should be soft but retain their shape as opposed to turning to lentil mush which can happen if you cook too long or too much water. Add the spinach after the lentils have been cooking for about 10 minutes, stirring it in so that it wilts slightly. Start cooking the pasta about 5 minute after you start cooking the lentils. Cook the pasta according to package instructions. When the pasta is done to your liking, drain and combine the cooked pasta with the lentil mixture and an extra tablespoon of olive oil. Add salt and pepper to taste. Serve and enjoy! Wine Pairing: A Chardonnay works well with the lively ginger flavors, or you can also go for a Sauvignon Blanc, such as a Pouilly-Fumé. More recently, I enjoyed this penne dish with a crisp Italian white wine made from Pignoletto grapes, and that paired nicely too. 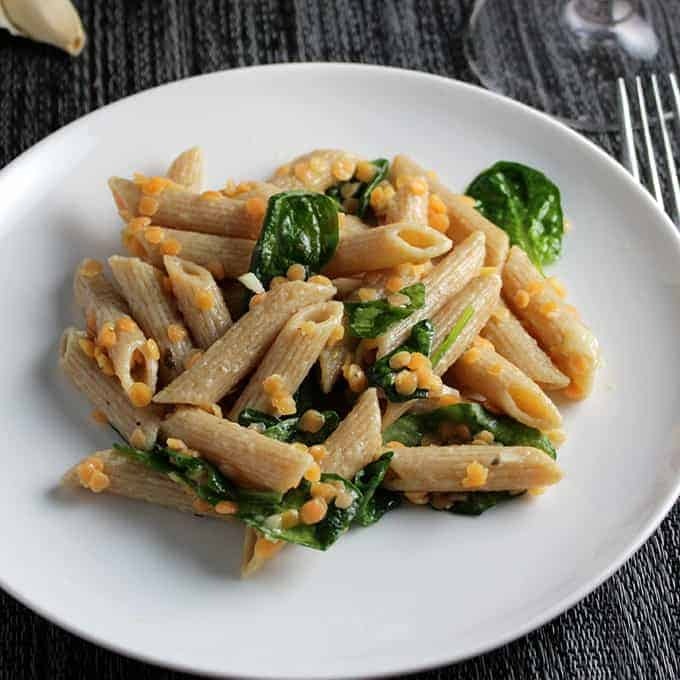 Time to check out the Penne with Red Lentils and Ginger recipe details! 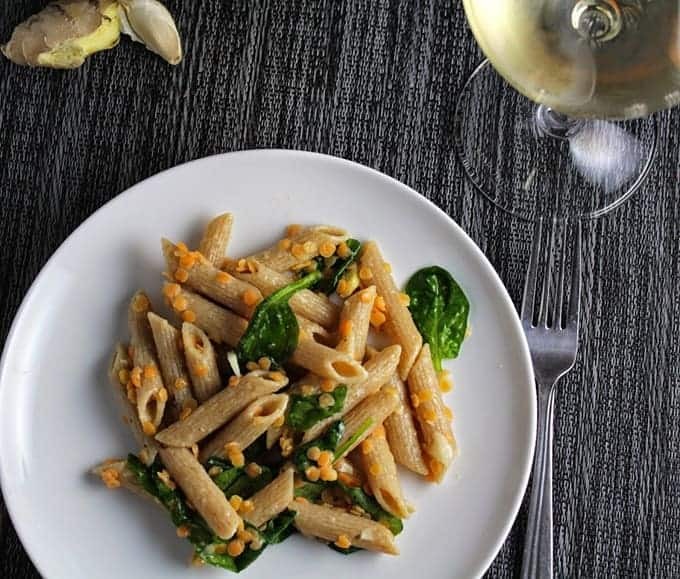 Penne with Red Lentils and Ginger is an easy and tasty vegetarian pasta dish. Melt butter in a medium pan, let it start to brown slightly, then sauté garlic and ginger for a couple minutes over medium low heat. Add the lentils, sage, a bit of salt, cup of water, and a tablespoon of olive oil. Bring to a boil, then reduce heat to medium low, cover pan. Check out the Weekday Supper lineup! Loving pasta here in Jan ! We enjoy our pasta year-round here, change up what kinds we have though. I love using lentils in dishes to up the protein and nutrients, but have never tried it with ginger. Thanks for the inspiration. Thanks for stopping by, Kristen. If you like using lentils I think you will enjoy this! I love all of these ingredients. Looks delicious! I love the addition of lentils to penne. Perfection!! Love the use of lentils with this pasta. Thanks Mary, it is a tasty combo with the pasta. We love Veg Planet here. Thanks Catherine, it all comes together nicely! This looks so, so delicious and like the perfect summer pasta recipe! Thanks for sharing 🙂 I love red lentils and I bet this tastes amazing with fresh sage and spinach. Looks so pretty, too. Thanks Tiffany, it is one of our favorites!